The Mercedes-AMG GT R Roadster combines expressive design with open-air lifestyle. With its 430 kW / 585 hp V8 biturbo engine, adjustable coilover suspension with active rear-axle steering, active aerodynamics and intelligent lightweight construction, this edition -- limited to 750 models -- is the new flagship of exclusive performance. A sports car through and through: With superior performance and confident super light carbon design, the Mercedes-AMG GT R Roadster rests at the top of the category thanks to its high-performance powertrain and incomparable effortless aerodynamics. Widened fenders and an even wider rear, in conjunction with the three-layer soft top and exclusive AMG performance forged wheels, make it not only a solely visual experience. AMG 10-spoke forged wheels painted in matte black with high-sheen rim flange, with 275/35 ZR 19 tires on 10 J x 19 ET 56 wheels (front) and 325/30 ZR 20 tires on 12 J x 20 ET 52 wheels (rear). The 3-layer fabric top lets the sunshine into your vehicle within a few seconds – or protects you against wind and weather. It blends elegantly into the vehicle silhouette and impresses with very high levels of warmth and noise comfort. You can open and close the soft top electrically even while on the move at speeds of up to 50 km/h. Building on the extensive standard equipment, the Mercedes-AMG GT R Roadster offers numerous options for customizing the exterior. 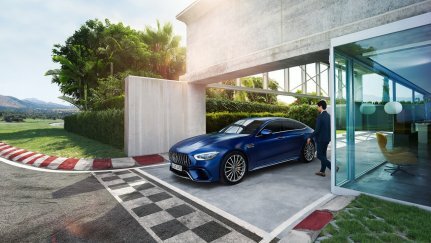 High-performance material meets high-performance car: The carbon-fibre elements for the exterior underline the sporty character of your Mercedes-AMG GT R, and lend your vehicle an even sportier and technologically more advanced look. The benefits of the material from the world of motorsport, namely high strength combined with low weight, are a perfect match for the AMG philosophy. The AMG Exterior Carbon-Fibre package II rounds off the sporty, high-tech appearance of your vehicle. The additional carbon-fibre elements are particularly striking: the exterior mirror housings and the fixed rear wing in carbon fibre leave an impression from every angle. High tech wherever the eye looks. Regardless of whether you use the innovative, colored display buttons in the center console or the AMG steering wheel buttons with round knob and integrated display, you can always handle the various functions of the sports car perfectly. The fully digital instrument cluster offers a screen design in three AMG-specific display styles. Also a real eye-catcher: the badge with the inscription "1 of 750", which refers to the limited edition of the Roadster. The control and display concept of the Mercedes-AMG GT R Roadster has been expanded to include a number of innovative elements. Touch-control buttons on the steering wheel and high-resolution displays set the standard in the segment. The digital displays and animations on the instrument and media display make vehicle functions easier to experience. Familiar strengths such as the intuitively understandable operating philosophy and the high legibility of all displays have been further enhanced. The AMG RIDE CONTROL suspension with threaded section for the AMG GT R allows the suspension characteristics to be adapted to the stretch of route being driven and your personal preferences. The adaptive damping adjustment offers three modes that can be selected at the touch of a button.